Should I Teach My Wife to Fly Fish? Question: After many years of displaying no interest in fly fishing, my wife suddenly wants to learn. Should I teach her? Answer: Well, there are really two parts to that question. 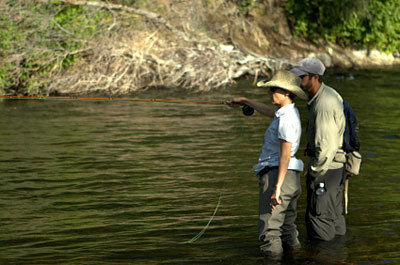 First, should a guy encourage his wife (or girlfriend or partner) to learn to fly fish? And, if so, should he be the one to teach her? As far as the first question goes, I’ve heard two competing arguments over the years. Uxorious types believe that a wife who knows how to fly fish means the angler will now have a loving partner with whom he can share his passion. Aside from the joys of bonding over a shared love of fishing, this arrangement may also translate to more opportunities to fish, since now you don’t have to split your free time between doing what you want to do (fish) and what the wife wants to do (something else). The counter argument is that a man’s fishing expeditions are a time for him to be away from his partner, giving each some time to breath and recharge. (Of course, if the wife is left home alone with the kids, how much recharging is she doing?) Depending on the relationship, there are merits to each argument. I know husband-wife teams who really enjoy each other’s company on the water, and I’ve guided couples who should never have gotten in a boat together. I leave this decision to each individual angler, his conscience, and his partner. On the second question, I have more definite opinions. As a fishing guide, I taught many couples how to cast and how to fish, and believe that a man should never try to teach his wife anything so potentially frustrating. Learning to cast and fish requires patience and a certain tolerance for failure. When a man tries to teach his wife to fish, there are actually added elements of frustration: the man desperately wants the woman to learn quickly because a.) he wants to go fishing or b.) he’s afraid if she doesn’t learn quickly, she’ll get frustrated and give up. The wife wants to learn quickly to a. please her husband and show him what a great sport she is or b.she’s afraid she’ll disappoint him or that he’ll start yelling at her. Fact is, hardly anybody learns quickly, so the added frustration can spiral out of control. I’ve seen husbands grab rods out of their wives’ hands rudely to make a point. I’ve had women crying quietly in the back of the drift boat. I’ve seen loving couples finish a day yelling at each other and threatening to withhold marital favors (no kidding!). And on and on. Get her a casting lesson from a real instructor, whether it’s someone at a local shop or at a fly-fishing school. Do NOT stand there and watch her lesson. Go fiddle with some reels or rummage through the fly bins. Hire a guide for a day of fishing. Tell the guide you’d like him or her to work with your wife. (I took my wife out with a female guide because I thought she’d learn better from a woman, which turned out to be true.) Ignore them and fish as if they weren’t even there, except to occasionally offer words of encouragement, such as “Nice cast!” or “Boy, that drift deserved a fish.” If she does catch a fish, don’t treat her like a three-year-old. Show genuine adult pride. Take her fishing, as much as she wants to. And when she doesn’t want to, don’t make a fuss. Even if your wife doesn’t end up as hard-core about the sport as you are, she will have a better understanding of why you need to be on the water. Note: Before anyone starts drafting a nasty letter: the same rules apply when the genders are reversed. I know several couples in which it is the female who is the passionate angler. The power dynamics are somewhat different, but the same rules apply.